The lives of celebrities never cease to grab our attention, particularly when their romances begin online. From online dating agencies to social networking, the way celebrities are finding love is changing all the time. The majority of people are on the search for love, celebrities included. We just love a good romance and to watch the lives of celebrities play out in the papers, well we seem to be fascinated as a nation by it. From break ups to make-ups to marriages and divorces, the lives of celebrities never cease to attract our interest. Remember Kate and Wills? The most eligible bachelor in Britain captured the attention of a nation when he broke up with Catherine Middleton and many cried – how could the romance with the girl next-door be over and who was at fault? And if one of the most beautiful girls in the UK couldn’t keep a man, what hope was there for the rest of us mere mortals? But thankfully then came the PDA’s and the hints that the pair had rekindled their romance. And who can forget the day she appeared in that royal blue dress with Diana’s sparkler on her left hand. From the moment Prince William and Kate announced their engagement, the media went into overdrive – what would the dress be like, who would be her bridesmaids, how would she wear her hair ¬¬– the list went on and on. Millions across the world stopped to watch the wedding – Times Square came to a standstill and why? Well because we all love a good love story and this was the happy ending for the couple. But what about the celebrities that are still seeking that happy ending? The saying goes ‘money can’t buy you love’ and when we hear of celebs logging onto online dating sites or announcing on live TV that they still haven’t found the perfect partner, let’s face it, it gives us a sense of satisfaction – you can’t have it all. The late Joan Rivers – a highly successful woman in her own right reportedly had a profile on match.com. It once read: “I love smart men, funny men, elegant men…if I had to choose between Brad Pitt stripped to the waist or an old George Clooney in a dinner jacket, George would win hands down.” All that money and Joan Rivers couldn’t buy a date with two of the hottest actors in Hollywood…bless! Thankfully, love can be found in Hollywood, particularly if you’re Irish. Take Chris O’Dowd, one of Roscommon’s most famous exports. The acting funny man is charming, handsome and so loveable. His love story with his now missus Dawn O’Porter developed over Facebook and their fate was sealed. The wedding followed in 2012 and the pair are now reportedly planning to move to Hollywood. Dawn has made no secret that the couple want babies and in the not too distant future. 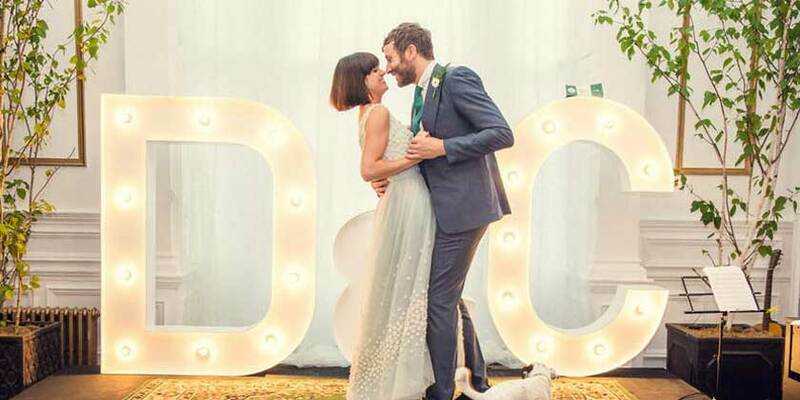 A more perfect couple we couldn’t imagine (although admittedly we are a teeny bit jealous!). Then there are the love stories that develop on Twitter. Whoever thought that 140 characters could allow love to blossom? But former Big Brother presenter Melanie Sykes met her husband through the social networking site and after a series of saucy tweets, their love was sealed. The 42 year old married 27-year-old roofer Jack Cockings in a lavish ceremony at a Dorset castle in April 2013. Their relationship raised a few eyebrows at first but the couple are said to be happily married despite tying the knot after a three-month romance. Followers of the couple could watch the ups and mostly ups of their relationship on the public site with Mel tweeting at one point: “Get off Twitter and get back in bed! You are insatiable! I love it! X” Too much information? Apart from our very own unlucky-in-love Sinead O’Connor, Irish celebrities haven’t been so forward in admitting they are on online dating sites but with more and more celebs in the UK and US resorting to the internet to find true love, it may be only a matter of time before the small pool of celebs here run out of love options and sign up. It would certainly make them appear more human and perhaps they’d even get more respect for their down to earth attitude towards finding a long-term partner. In the meantime, we will keep searching online and who knows, we might come across our very own celebrity!